I’ve been on a binge of sorts—a sweater binge. I finished the sleeves for my Dale of Norway Gjende. Of course, Gjende is still awaiting the cutting of the steeks and the sewing in of the sleeves. But the end is near. 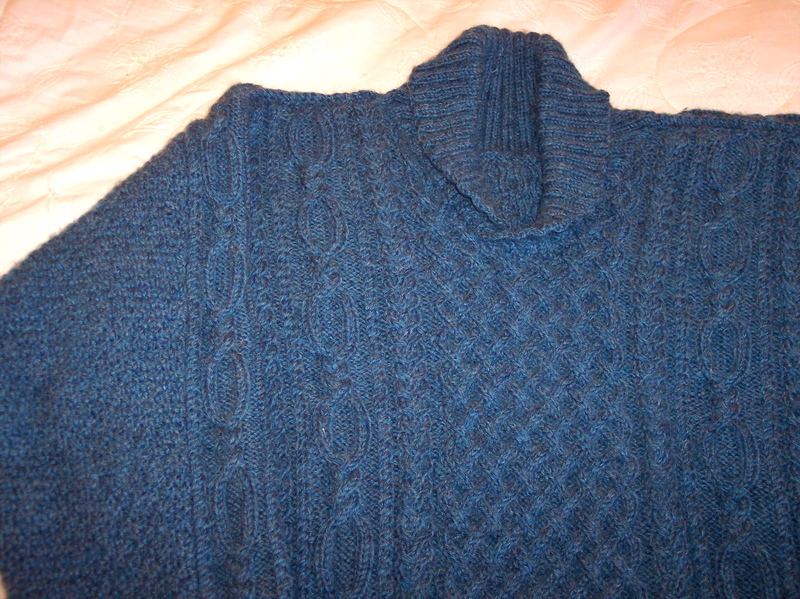 After I work up the nerve to sew in the sleeves, all that will be left to do is knit the neckband. I knitted the Traditional Gansey for my son as a Winter Solstice gift. And just the other day, I finished my long-neglected Cozy Shawl Collar Pullover (top left), designed by the wonderful Janet Szabo of Twists and Turns fame, and featured in this installment of my fabulous blog. But I’m not done yet. I have almost reached the joining of the shoulders in my second Beth Brown-Reinsel White Gansey, and I plan to soon pick up my poison green Starmore Kinsale which has been relegated to the UFO pile for all too long. Then there is the new KAL starting January 15th. We are doing Aran designs from Janet Szabo’s Twist and Turns newsletter. I’ve chosen to do a design from the most recent issue called the Foothill Road Aran (top left).